ZeroLoss Containment Shells enable Sundyne sealless magnetic drive pumps to resist a wider range of volatile and heat sensitive chemicals, and endure the rigors of a wider range of process applications. Sundyne, a global leader in the design and manufacture of pumps and compressors today announced that it has expanded the ranges for its ZeroLoss™ containment shells to Frame l, ll and lll versions of its most popular sealless magnetic drive pumps. Some oil, gas and petrochemical applications that span the full hydrocarbon chain pose challenges to pump seals, by creating magnetic losses and by heating the process fluid. Sealless magnetic drive pumps from Sundyne HMD Kontro overcome these challenges through containment shells, which eliminate eddy current losses in the pump, reduce energy consumption and enable sealed-to-sealless conversion. Previous containment shells were made of metal, but Sundyne’s ZeroLoss Containment Shells are engineered from a composite material of poly-ether-ether-ketone (PEEK) and carbon fibre that was initially developed for military and aerospace equipment. 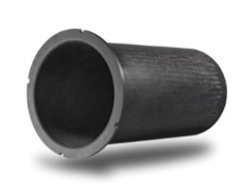 Five times lighter than steel but just as strong, the ZeroLoss Shell increases the pump’s reliability; provides greater efficiency; increases temperature ranges from -40°C to +150°C; bolsters the pump’s resistance to thermal shock; and eliminates potential vaporization of process chemicals near the pump’s bearing. As a result, ZeroLoss Containment Shells enable Sundyne sealless magnetic drive pumps to resist a wider range of volatile and heat sensitive chemicals, and endure the rigors of a wider range of process applications. For further information about using ZeroLoss™ containment shells with HMD Kontro sealless pumps, visit http://www.sundyne.com/hmdkontro.